The postcard at the top of this post has nothing to do with Manet or Victorine Meurent. It’s a French postcard featuring a young dancer or performer named Mademoiselle Rochet, but it’s from 1908—nearly 50 years after Victorine began posing for Manet. 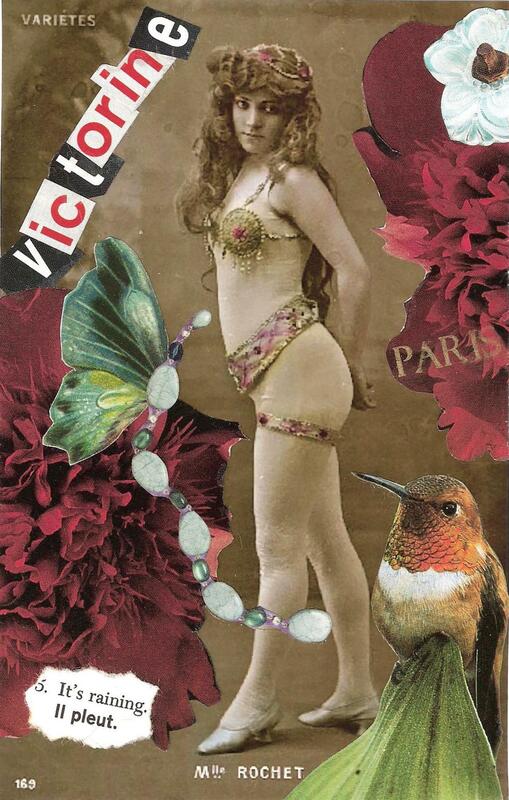 Nevertheless, the postcard helped me find my way to Victorine in Paris Red. I found the postcard online back in 2002 or so, and I was taken by the young woman’s face. I think that’s a good phrase to describe her effect on me: she took me—back in time, into her gaze and waving hair, into my own imagination. Though I knew the postcard and the young woman were from a much later time than the 1860s, the feeling I got about the young woman and her direct gaze somehow allowed me to reach back further in time to Victorine—but also to something entirely new and entirely mine. The young woman in the postcard, Mlle Rochet, was a bridge to the fictional Victorine Meurent I wanted to create. Making the collage allowed me to spend time with my thoughts of Victorine, and to imagine her in a way that was not directly shaped by Manet’s paintings. I wanted to write the story of Victorine Meurent, but I did not want to write biography—I wanted to create fiction. To do that, I had to step away from Manet’s work and into my own vision of Victorine. Not that I really understood this when I made the collage. I just wanted to make the thing. I wanted to place the images of the peonies and hummingbird beside Mlle Rochet and see what happened. I wanted to go into the state of mind I enter when I make things with my hands. And it worked.